On the north-east coast of Ireland, you will find the majestic Glens of Antrim. Or ‘The Glens’ as the 9 Glens of Antrim are known locally. These stunning Glens radiate from the Antrim plateau down to the coast between Larne and Ballycastle. This means that there are good reasons why this is an area of outstanding natural beauty ‘AONB’. As a result, the Glens coastline is a significant tourist attraction in Northern Ireland. Consequently, it is no surprise it contains some of the better-known backdrops in the HBO television series ‘Game of Thrones’. Some of the more scenic villages that you may visit during our walking holidays are; Ballycastle, Cushendun, Waterfoot, Cushendall, Glenarm and Carnlough. Each of the 9 Glens has its own unique character and beauty and offers its personal reasons for visiting. Take Ballygally for instance just south of Glenarm, where the local hotel boasts a (friendly) ghost. Take a short drive north and you’ll find Carnfunnock Country park. 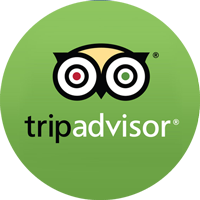 Why not stop here for a visit and try to solve the beech maze. Following the coast north, you will undoubtedly be amazed by the coastline and the beautiful beaches at Glenarm, Carnlough, Cushendall and Cushendun. Are you interested in the story of Saint Patrick? Well, just inland you will find Slemish Mountain. This is where Saint Patrick was known to tend sheep as a young shepherd’s slave. Further North the coast road becomes more windy and tortuous, but on a clear day, the stunning views of Scotland and the Scottish Isles make it all worthwhile. Waterfall walk in Glenariff Forest Park. 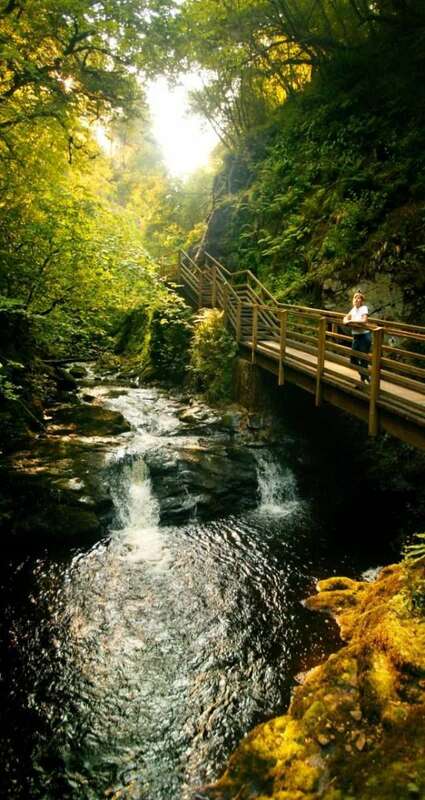 One of the more spectacular walks in our walking tours must surely be Glenariff Forest Park. Glenariff is better known as the Queen of the Glens with its majestic waterfalls and walking trails skirting the steep hillsides of the Glen. Running through the Glens of Antrim is the 26Mile/41Km ‘Moyle Way’. 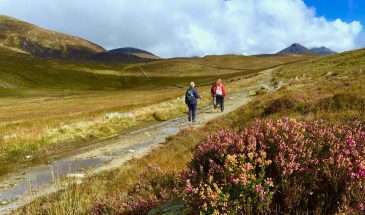 Let it guide you through the Glens and its magnificent geology, history, folklore and wildlife. The ‘Moyle Way’ passes through some of the 9 Glens and its abundance of rivers, ancient monuments and exposed hilltops before reaching its end in the stunning Glenariff Forest Park. The 9 Glens of Antrim offer plenty of ‘Craic’. 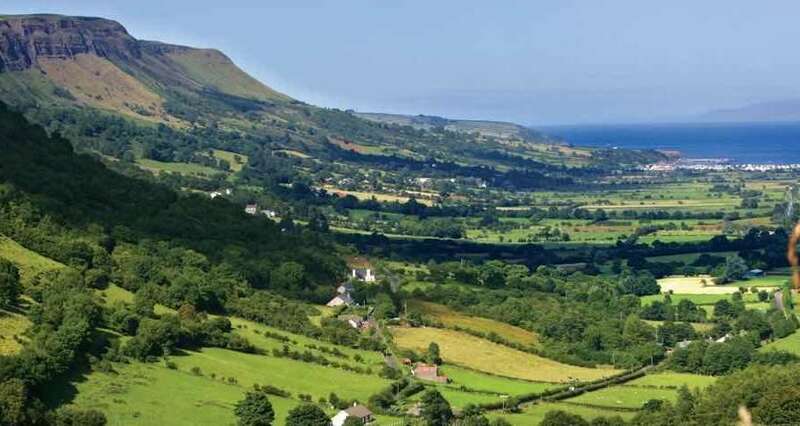 Cushendall, known as the capital of the Nine Glens is a lively centre with Pubs offering great food, a cold pint, music, dance and plenty of craic. Just north again and you’ll find Cushendun a preserved village famed for its Cornish villages by the National Trust. At the most northern point, you will find ‘Fair Head’ and Ballycastle with a vibrant community and harbour from which you can take a ferry to Rathlin Island. 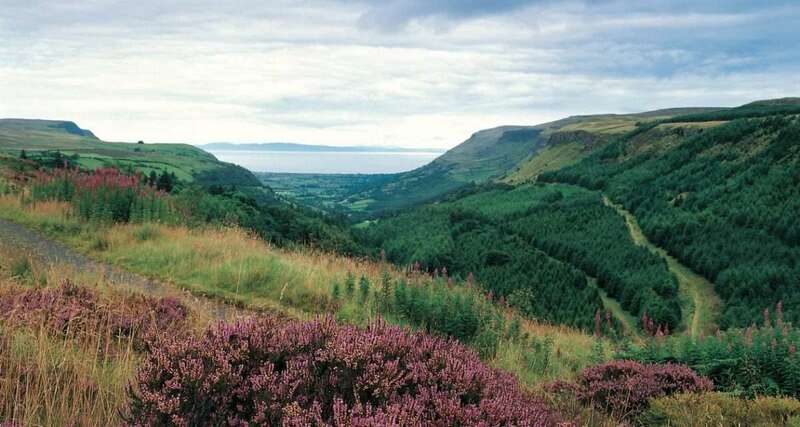 Furthermore, The Glens are also famous for their great festivals, embodied by the Heart of the Glens festival at Cushendall in August Glenarm, Carnlough and Cushendun have festival weeks in July. You will find a lot of evidence of Neolithic communities in the Glens of Antrim. From megalithic tombs left by the Neolithic people in the uplands of Glencoy while they lived and farmed on the low lying lands on the coast and along the rivers of the Glens. Due to the coastline being a source of food and flint as evidenced by Neolithic Tool production sites in the Glens. As a result at ‘Madman’s Window’ near Glenarm, a treasure cove of stone axe rough outs was found together with chipping floors, Neolithic Pottery, scrapers and arrowheads. In Carnlough, at Bay Farm, a Neolithic site was located near marshland where archaeologists found charcoal, debris, postholes axes and flint cores as well as Neolithic Pottery. Visit the Glens of Antrim on one of our Walking Holidays and book today!